While there is a science fiction dream of creating fully autonomous robots out there and many teams are making great strides toward that goal, I believe there is an incredible gold mine of value in tele-robotics (i.e., robots that are fully or partially controlled by people) that is far from being fully appreciated. Tele-robotics is already applied to surgery, search and rescue operations, bomb disposal, space missions, deep sea exploration, and more. 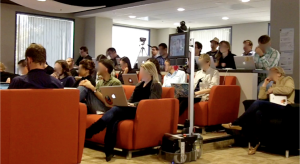 At Willow Garage, we used tele-robots for a much more commonplace application — telecommuting. My co-worker, Dallas, lived in Indiana while he worked with us at Willow Garage in California. For many months, I only knew him as a voice in a box on the huge meeting room table (i.e., voice conferencing). One day, his colleague, Curt, rolled him into a meeting as a videoconferencing laptop on a wheeled cart. Then we at least got to see what he looked like, but Dallas was constantly frustrated with having to rely upon Curt to point his camera in the right direction and having to ask to be pushed around the office. Finally, one weekend in 2009, Curt and Dallas borrowed some robot body parts from the PR2 (Willow Garage’s autonomous robot) and put together something awesome that enabled Dallas to drive himself around the office. 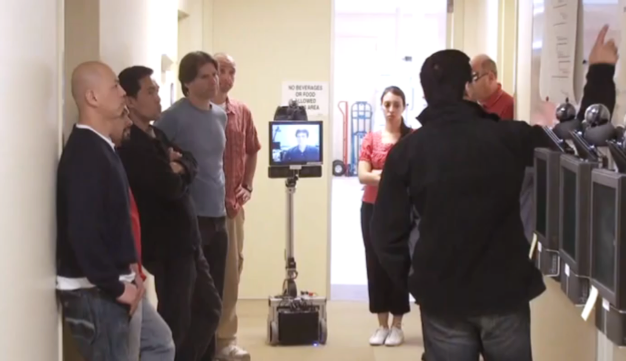 The following Monday, Dallas rolled into our weekly company standing meeting in a tele-presence robot. Some people called it Skype on a Stick. Some called it DallasBot. Over time, we just called him Dallas. The robotic body was no longer relevant because it was really just Dallas who we were talking, working, and hanging out with. We eventually stopped calling them robots altogether. At first, I was hesitant about this seemingly geeky hobby project. After several weeks, the power of this tool became so clear and exciting that I changed the focus of my research to exploring remote presence. Curt and Dallas built about 25 more prototypes, which we fielded at organizations around the SF Bay Area. Our field study team spent many months, looking at how people actually used (or did not use) these systems. Over the next few years, we took the lessons learned from those partners to examine ways to re-design these robotic systems to improve remote people’s ability to be part of the team, be influential, maneuver effectively through indoor spaces, and present themselves well to others. Our prototype was picked up and featured in the TV show “The Big Bang Theory” as ShelBot. As the stories spread about these systems, we were unable to keep up with requests to try and buy our prototypes. In 2012, Willow Garage spun out a company called Suitable Technologies, which is focused upon developing and selling remote presence systems to others. I serve on their technical advisory board. You can contact Suitable for a test drive or to purchase their much improved, commercial version of remote presence. Takayama, L. (2012). Telepresence and apparent agency in human-robot interaction. In Sundar, S. (Ed. ), Handbook on the Psychology of Communication Technology. Malden, MA: Wiley Blackwell. Takayama, L. (2011). Toward making robots invisible-in-use: An exploration into invisible-in-use tools and agents. In Dautenhahn, K. (Ed. ), New Frontiers in Human-Robot Interaction. Amsterdam, NL: John Benjamins, 111-132. Takayama, L., Marder-Eppstein, E., Harris, H., & Beer, J. M. (2011). 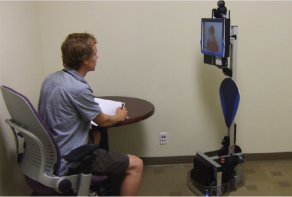 Assisted driving of a mobile remote presence system: System design and controlled user evaluation. Proceedings of the International Conference on Robotics and Automation: ICRA 2011, Shanghai, CN, 1883-1889. Takayama, L. (2010). On making robots invisible-in-use. Proceedings of International Symposium on New Frontiers in Human Robot Interaction: AISB 2010, Leicester, UK. Takayama, L. (2009). Making sense of agentic objects and teleoperation: In-the-moment and reflective perspectives. Late breaking results of Human-Robot Interaction: HRI 2009, San Diego, CA, USA, 239-240.